Thank you for visiting Vehicle Transport Services. We take pride in our vehicle shipping business and we love what we do. If you are are in need of having your vehicle shipped from one state to another you’re in the right place. The staff at Vehicle Transport Services has been in the auto shipping industry for a combined 29 years. Our first priority is our customers and making sure they have a stress-free vehicle shipping experience from start to finish. Our 5-Star Reviews and 100% rating ensures that you are in great hands. Our friendly staff and reliable truckers are happy to meet and exceed any and all of your expectations when it comes to your vehicle shipping service. Open Vehicle Transport: This form of vehicle transportation is the most affordable and best option for most people. Your vehicle will be transported on the same type of vehicle carrier that auto makers use when they transport new vehicles from the factory to the dealerships. Open vehicle shipping is safe, secure and reliable. Over 95% of cars are transported using open vehicle transport services. Enclosed Vehicle Transport: This vehicle transport services is reserved for more high-end, classic and exotic vehicles. These vehicles are transported in a vehicle carrier that is covered by a canvas material or metal. The carrier looks more like a semi-truck and is more secure. Also, your vehicle arrives to the destination in showroom condition. This type of vehicle transport service is more expensive, but well worth the price. Enclosed vehicle shipping services are great for people wanting their vehicle flawless when it is delivered. Door To Door Vehicle Transport: We pick up and deliver your vehicle right from your doorstep. With door to door vehicle shipping your life gets a little bit easier. The vehicle hauler gives the customer a 1-2 hour notice prior to delivery so the customers know exactly when the vehicle will be getting picked up and delivered. Terminal To Terminal Vehicle Transport: This method of vehicle transportation is for customers who may not be available for the pick up or the delivery of their vehicle. We can pick up and/or deliver your vehicle to a terminal location that is closest to you. A Terminal location is similar to Terminal parking at the airport. Terminal to terminal vehicle shipping is excellent for military going off on duty, families relocating, and businesses relocating employees. The customers get to pick up and deliver their vehicle on their own time schedule. When you are in need of a professional vehicle transport company, the choice is easy. Vehicle Transport Services is the leader when it comes to the need of shipping a vehicle from one state to another and shipping a car across the country. When you transport a vehicle from one state to another, you want to have a company that you can trust and rely on. 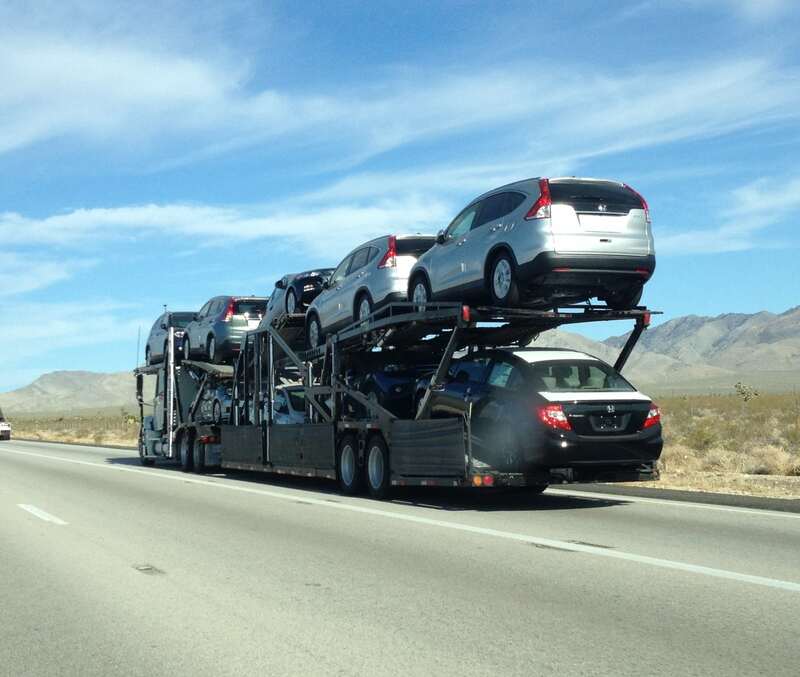 Vehicle Transport Services suggests to get 3-5 different car shipping companies to quote you. Then once you have your quotes it is time to check reviews, ratings and online profile from each vehicle shipping company. Doing a little research goes a long way in the vehicle transportation industry. Once you have vetted each of the companies, you should be able to choose which company you feel most comfortable with. As for the cost to ship a car, there are a few factors that can go into pricing. The time of year you’re shipping, the size & weight of the vehicle, the route/distance from origin to destination, and the type of vehicle shipping service you choose. All of these can make fluctuations in the cost to transport a vehicle. Speak with a vehicle transportation specialist so we can figure out your specific cost.